Born in April 1990 in the city of Mardan, Fakhar Zaman is a cricketer who has had to toil extremely hard to work his way up the cricketing ladder in Pakistan and is certainly not one of those cricketers who have had the privilege of political backing, a silver spoon or indeed selectors who favoured him. Zaman moved to the cricket-mad city of Karachi at the age of 16 and joined the Pakistan Navy as a sailor in 2007. It was a career that his father had chosen for him after declining his son's wishes to pursue a career in the sport that he loved, cricket. However whilst in Karachi serving in the Navy, Fakhar continued his passion for cricket and started to represent the Pakistan Navy Team in domestic matches. His Navy team coach Azam Khan persuaded him to take up cricket professionally in 2013, to follow his dream, to try and make it as a cricketer. As the saying goes, the rest is history. After some average and below-par performances initially in the domestic circuit, it wasn't until 2016 that Fakhar settled into top-level cricket and caught the attention of the selectors when he was the second-highest run-scorer in the Pakistan Cup. Following success in the Pakistan Cup, he also had a successful 2016-17 Quaid-e-Azam Trophy tournament. This alerted the Pakistan Super League franchise Lahore Qalandars, who signed Fakhar in 2017 where he was mentored by New Zealand great Brendon McCullum. In March 2017, after being spotted by Mickey Arthur at a training camp, Fakhar made his international debut in a T20I against West Indies, batting at number 5 but scoring only five runs off eight balls. The inauspicious debut was only a minor blip for Fakhar. Bigger and better things were on the horizon for the southpaw. Picked for the 2017 Champions Trophy by the Inzamam-ul-Haq-led selection committee, Fakhar was seen as a dashing left-hander who had the ability to give Pakistan quick starts, but the critics argued that he did not have the temperament to succeed in 50-over cricket. On ODI debut, Fakhar scored a rapid 31 against South Africa in Birmingham but once again critics stated that he was a batsman who was too much of a risk at the top of the order and not an option who would provide Pakistan with stability. As Pakistan's Champions Trophy campaign eventually gathered pace in England, there was no doubt that Fakhar's good form gave Pakistan much-needed impetus in the early overs and his next two scores against Sri Lanka and England saw him make 50 and 57 off 36 balls and 58 balls respectively. Fakhar was providing Pakistan with an alternative option and something different compared with tried and tested opening batsmen more reliant on occupying the crease than scoring quickly. Fakhar had arrived and started to impress and gain confidence. Fakhar had started to look like a cricketer who believed he belonged in international cricket and wasn't just there to make up the numbers. Despite what he does in future and irrespective of the many great innings he may play in future, perhaps the innings that many will remember Fakhar by will be the 114 he made against India in the Champions Trophy final. Out off a Jasprit Bumrah no-ball, Fakhar didn't look back against Pakistan's arch-rivals. The packed house at The Oval watched in admiration as Fakhar cut and pulled and drove his way to a magnificent yet responsible match-winning hundred. The former Navy man, nicknamed Fauji by his teammates, was named Player of the Match in the Champions Trophy final and his name was on the lips of Pakistani cricket fans the world over. Since the Champions Trophy, Fakhar Zaman has steadily cemented his place in both twenty and fifty-over cricket for Pakistan. Labelled a slogger by some, he has shown that he is not a batsman who just tries to launch it to the boundary. Working closely with Pakistan batting coach Grant Flower, Fakhar has displayed that he has more than one string to his bow and has displayed maturity and patience at crucial times. He has also exhibited that he is a team batsman and sacrificed his wicket at times in the pursuit of quick runs for his country. 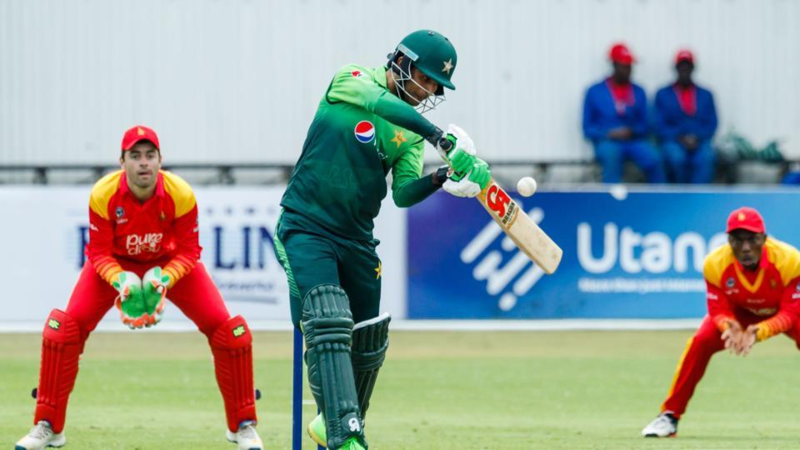 And so to Bulawayo where Fakhar smashed record after record on his way to 210 not out against a depleted Zimbabwe bowling attack. In his previous innings before his record-breaking double-hundred, Fakhar had scored 60, 117 not out and 43 not out. Fakhar stated that Mickey Arthur had told him that the double-hundred was a possibility and he didn't let his coach down with a dazzling array of strokes. Fakhar's 210 not out is the fifth highest individual score in a ODI, it's also the highest score by a Pakistani batsman in a ODI beating Saeed Anwar's 194 against India and the stand he shared of 304 with Imam-ul-Haq is the highest ever opening partnership in ODI history. Fakhar's rise through the Pakistani cricket system is a heartening victory for the average man and for the young cricketer who aspires to reach the dizzy heights and who doesn't have the financial backing and resources at his disposal. Fakhar's success story is a victory for all those young cricketers who are toiling away in Pakistan, waiting for their chance to impress and one hopes that Fakhar's story will inspire many other success stories in Pakistan cricket.